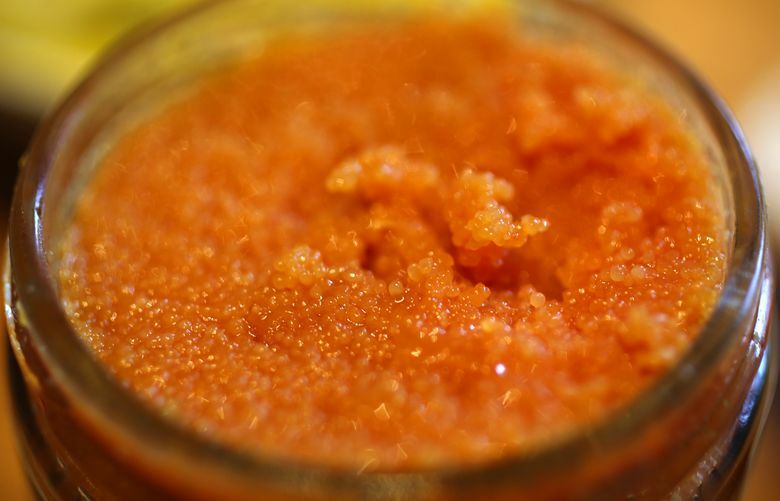 Omega Ouzeri chef makes magic from leftover bread and intensely flavored carp roe. TARAMASALATA IS AMONG the most rustic of foods, borne of the waste-not, want-not ethos of Greek fishermen of yore. Acclaimed chef Zoi Antonitsas, who’s Greek and down-to-earth herself, loves the rich dip/sauce — it’s unbelievably creamy for something without dairy, and it’s full of both umami and, though you’d never suspect it, bread. 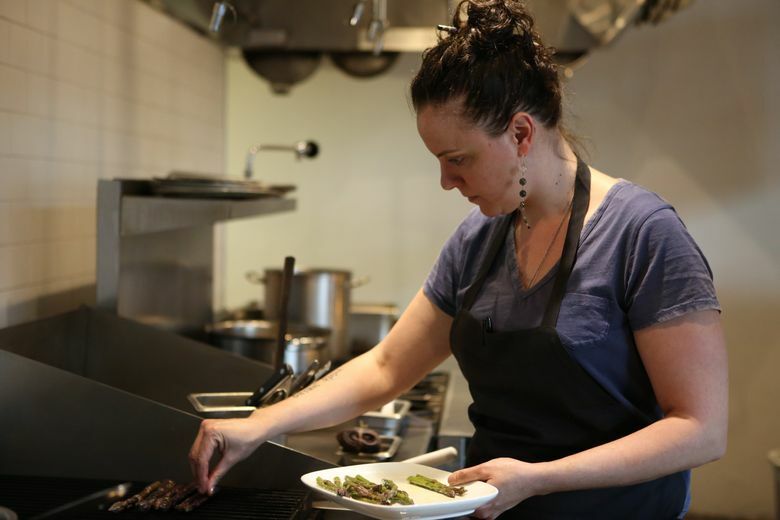 The version Antonitsas makes at Omega Ouzeri, where she’s been the chef since December, quickly became “super, super popular,” she says. (She made a similar — and similarly adored — dish while heading up the kitchen at Westward, too.) 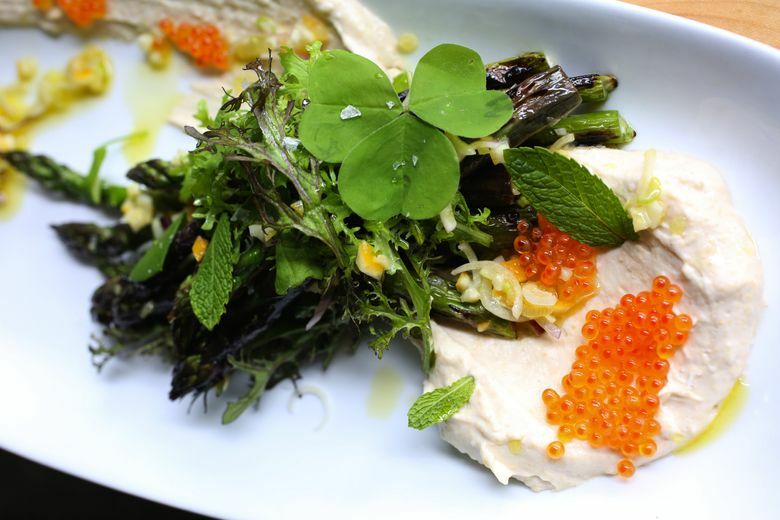 It certainly looks artful for something with such humble origins, with its spoon-strokes of sauce, pretty pile of asparagus (though any grilled vegetables will do), lovely little wild greens and pops of brilliant trout roe for contrast. Antonitsas says not to feel timid or fussy about plating, that “it should really feel natural.” Of course, she studied art at Cornish before becoming a chef, which helps make hers look so gorgeous. 1. Cover bread with very hot water. Allow to sit for at least one hour. Drain, and squeeze off excess water. 2. Combine shallot, garlic, lemon juice/zest, tarama, salt and pepper in food processor, and puree until smooth. 3. Add in bread, blending slowly, then add in olive oil slowly, drizzling it in to emulsify. Finished sauce should be thick, creamy and rich. 4. Smear across one big or several smaller platters, then top with grilled vegetables of choice, greens if you like and Meyer lemon vinaigrette (see recipe), with trout caviar as an optional garnish. Sprinkle with sea salt to finish. Combine and drizzle/spoon over the taramasalata topped with grilled vegetables and greens. 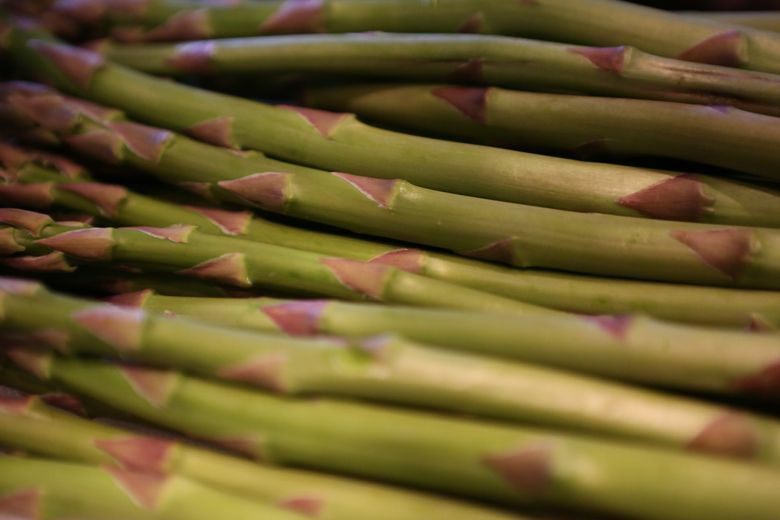 “I like to cut vegetables in large pieces, so a zucchini I’d halve lengthwise, as opposed to slicing it into four or five pieces. Cut onion into thick rings. Larger pieces allow for longer, controlled time on the grill. “I generally like to marinate my vegetables for grilling with a little extra-virgin olive oil, chopped fresh herbs, lemon zest, salt and chili flake. I do not marinate far in advance, because when you add salt, it pulls moisture out and can make the vegetables wet. “When grilling, make sure your grill grates are clean and that your grill has been preheated. I then use an old rag that has been tied and dipped in a bit of oil to grease the grill just prior to adding vegetables. Typically, I like to oil the grill and use very little oil on the ingredients — this prevents flare-ups. Bethany Jean Clement is The Seattle Times’ food writer. Reach her at bclement@seattletimes.com or 206-464-2050. On Twitter: @BJeanClementKen Lambert is a staff photographer.